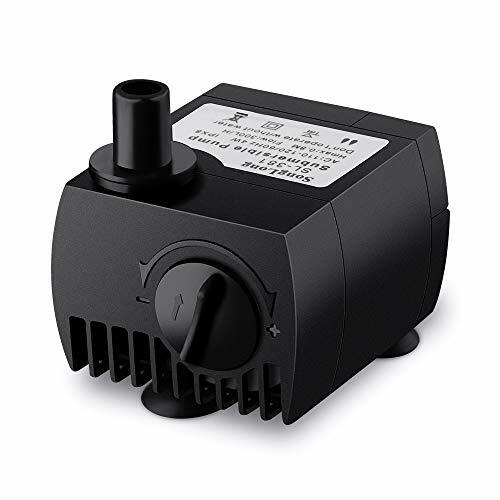 The VicTsing submersible pump features compact, multifunctional, and detachable, perfect for aquarium, tabletop fountains, water garden and hydroponic systems. Compact design is great for space-saving on your tabletop fountain. The maximal flow rate can be up to 80 gallons per hour. Lift height can be up to 2.6ft. 1.Please use socket with stable voltage and keep the motor running within rated power to ensure long lifespan. 2. Prohibit no-load running. Put the pump into water first before connecting power supply. When changing water, please disconnect power supply. It would shorten its lifespan and lead to making loud noises when running in the air for long time. 3.If the product suddenly stop working or make noises, which may caused by debris blockage. Please clean it regularly about once every two months, or add some olive oil on the rotor. 4.Please note if the water level, layout of the water tank match the bump power before purchasing. If the water is too little, motor power is too high, so as the water flow level, the swashing water would make loud noises. Different bump suits different water tank. 5.The maximum flow rate is 80GPH; there might be a plus-minus tolerance, Insufficient power and insufficient frequency would affect the flow rate.If connected with a water pipe, the maximum flow rate would less than 80GPH. If the water sprays out the container, the flow rate would also less than 80GPH. 6.Two different sizes nozzles are provided. If you use the smaller one, the maximum flow rate would less than 80GPH. Detachable and Cleanable No need any tools to detach it, easy to separate, easy to clean. GOOD SELECTION OF NATURAL MATERIAL Good selection of natural rough stone which feature is gentle, easy to carve, and has strong oil texture and rich color! They are processed in different and irregular shapes with top-class processing techniques. Are you looking for materials for artificial marble, quartz floor, filling materials of mesa, water filtering media and decoration materials? YOU may as well try our chip stones. We offer you unexpected decoration effects. DIFFERENT SIZES AND COLORS AVAILABLE : Beautiful variety from 9-16mm (0.2-0.6). Vintage colors and vivid colors for your choice. They have some profound meanings. For example,Turquoise stands for success and good luck; Rainbowstone stands for happiness and fluorite stand for calmness and energy and so on. Small items but have profound implied meaning in them. For more, please check out the following product description. IDEAL HOME DECOR You could use them to display your jewelry, necklace or other precious ornaments and other accessories, prevent items from sliding around. If applied to the fish tank, these could decompose the fish poop and prevent the it from flowing in the water. Most importantly they could purify water. If applied to the flowerpots, these could reduce the splashing water when watering the flowers. Best decorative soil substitute for indoor plants. QUALITY AFTER-SALE SERVICE If you do not satisfy with our products or if you have any questions, please feel free to contact us, we would reply you within 12hours. We 100% guarantee to solve all the problems to your satisfaction. FREE REPLACEMENT or REFUND within 90days. Height:About 2";WITHOUT CERTIFICATE,IF YOU MIND,PLS DO NOT BUY. The color and clarity may various, so you will receive a similar item shown in the picture. A terrific gift idea for those who are just beginning to experiment with healing crystals. BUY WITH CONFIDENCE 100% SATISFACTION GUARANTEE We sure you will love our unique vibrant quartz.However,if you are unsatisfied in either way,you have No-Questions-Asked, 30-DAY Money-Back Guarantee. 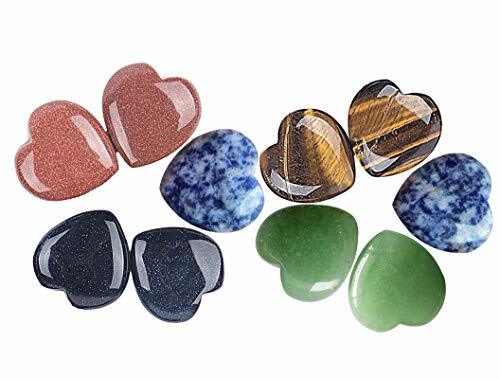 Worry stones (palm stones,thumb stones) are smooth,polished gemstones,in the shape of heart about 40mm,used for relaxation or anxiety relief.They are used by holding the stone between the index finger and thumb and gently moving one's thumb back and forth across the stone. From the perspective of cognitive behavior therapy,the use of worry stones is one of many folk practices that can function as psychologically healthy self-soothing exercises.Such techniques are imparted at an early stage of treatment,displacing any familiar but destructive coping methods(nail-biting,scratching,lip-biting,etc. )that the patient may have developed.This helps ready the patient to safely confront anxiety or trauma.Worry stones are simple and intuitive enough to be useful in therapeutic contexts where complexity and unfamiliarity are paramount concerns,such as when offering short-term treatment to refugees or children with post-traumatic stress disorder.After a patient has mastered a more sophisticated relaxation script for anxiety management,the worry stone itself can serve as a physical relaxation script reminder;the patient may notice an impulse to use the object,and thereby become aware of their own anxiety. 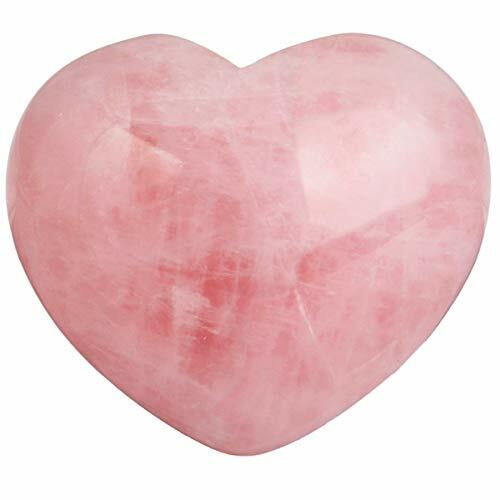 Rose quartz is often called the "Love Stone. "It's energetic hallmark is that of unconditional love that opens the heart chakra.This makes rose quartz a stone for every type of love:self-love,family,platonic,romantic, and unconditional.As a variety of quartz,rose quartz has high energy,and this strong energy can enhance love in virtually any situation.It is the perfect gift for your loved one. 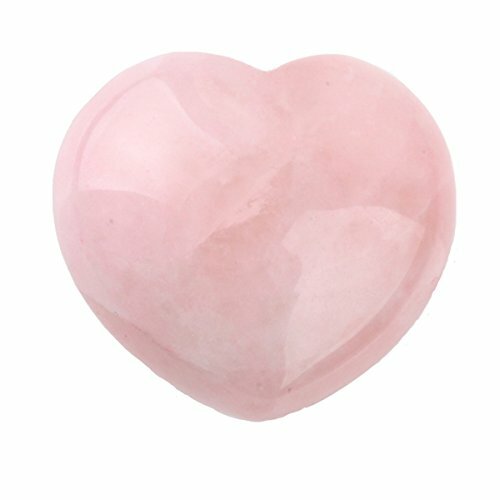 Carved from Natural Rose Quartz,each piece is unique,picture is only for your reference,the size and the color may vary from each other. Worry/Palm Stones-feel great to hold in your hand for relaxation or anxiety relief.Enhance meditation,aid in healing the mind,body and spirit.Strengthens the heart and allows energy to flow through the heart chakra properly. 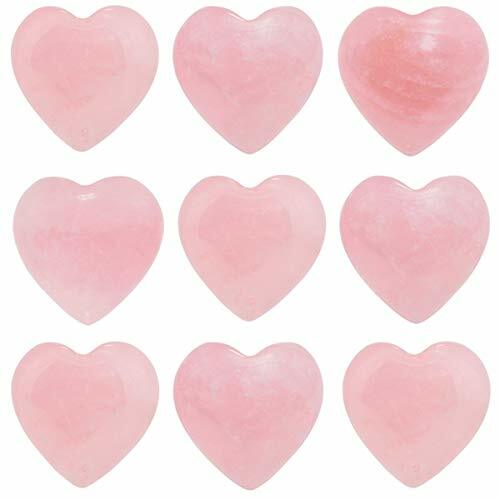 Best Gift Choice--Puff hearts make very special personal gifts.Arrive to someone full of positive energy and cleansed of all negative vibrations.Also makes a great Housewarming,Birthday,New Year Gift for Mother,Father,him,her,man,woman.Conversation starter for party,entertaining or wedding registry. Selenite sticks come in aprox 7" to 8.5" long and 1" to 2" wide. It is a white stone. Selenite Crystals are remarkably peaceful. They instill a deep sense of inner peace, clarity and carry a very high vibration that makes them ideal for healing. The crown chakra is associated with the Selenite stone and aside from this you can use Selenite to contact your Guardian Angel or Spiritual Guides. Cleansing and clearing other crystals of negative energies and vibrations is another wonderful property of Selenite. Unlike other metaphysical stones, you will never have to recharge or cleanse your Selenite crystal because it does that by itself. In new age and spiritual work, Selenite is considered one of the more powerful healing stones. It ensures a peaceful environment when stones are placed around the home and is an excellent stone for meditation. Crystals are remarkably peaceful. They instill a deep sense of inner peace, clarity and carry a very high vibration that makes them ideal for healing. The crown chakra is associated with the Selenite stone and aside from this you can use Selenite to contact your Guardian Angel or Spiritual Guides. Cleansing and clearing other crystals of negative energies and vibrations is another wonderful property of Selenite. Unlike other metaphysical stones, you will never have to recharge or cleanse your Selenite crystal because it does that by itself. In new age and spiritual work, Selenite is considered one of the more powerful healing stones. It ensures a peaceful environment when stones are placed around the home and is an excellent stone for meditation. We decided to offer these 3 crystal points as a set because they are our MOST popular crystals due to their versatile metaphysical properties. Clear quartz is known as a "master healer" for its cleansing properties, amethyst calms the mind and grounds the spirit and rose quartz opens the heart chakra to let love flow. Combine all three crystal points to maximize their healing benefits, use them to add dimension to your crystal grids, mix them up with other crystals or use them individually as needed. 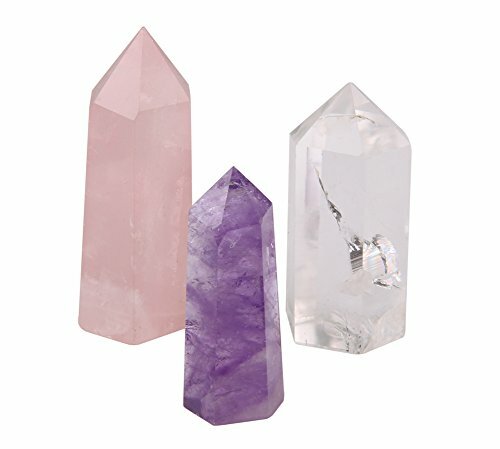 All of our quartz crystal wands are unique, but you will receive ones that are comparable to the ones featured in the images. The 2" wands can be added to crystal bowls, displayed on a shelf, kept in your medicine bag. It can be used as a home or desk decoration, it's fine to send as a present in most of occasion. Handmade, so all of them are unique. This deal will not last long. Click 'ADD TO CART' to order your own crystal wand combo pack today! 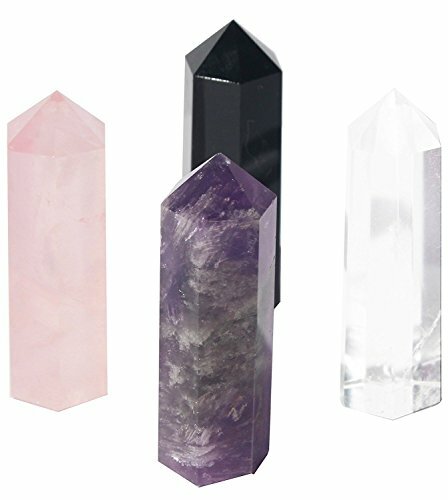 SET OF 3 CRYSTAL POINTS: Each one of these crystal sets includes one 2" crystal quartz wand, one 2" amethyst crystal point & one 2" rose quartz wand. The bottoms of the wands have been flattened, making them easy to stand when not in use. 2 CRYSTAL WANDS: Each of the healing crystal wands included in this set measure approximately 2 tall. This makes them the perfect size for crystal healing or displaying. BEST HEALING CRYSTALS: Crystal quartz, amethyst and rose quartz are known as 3 of the must-having crystals. Use the crystal points individually for specific healing techniques or use them all together if desired. 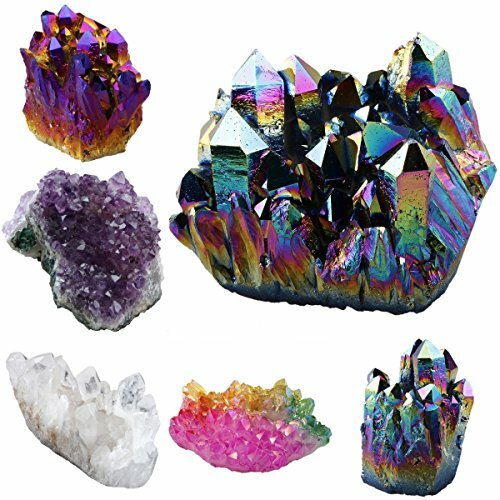 UNIQUE, AUTHENTIC CRYSTALS: Our crystals are 100% genuine, so they do vary in color and clarity. You won't necessarily receive the exact crystal points that are featured in our images. However, you will receive crystal wands which are similar in shape, shade and size. FANTASTIC GIFT IDEA: This 3 piece crystal wand set makes a terrific gift idea for those who are just beginning to experiment with healing crystals. 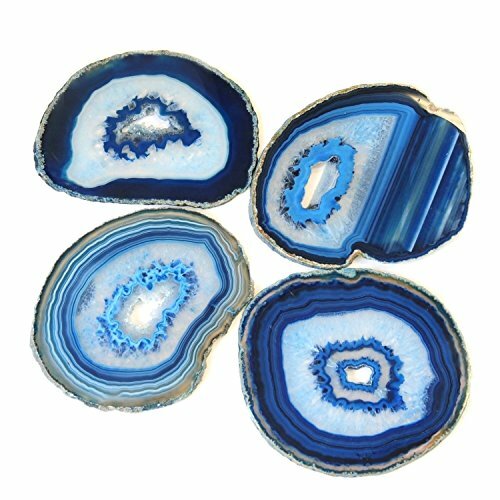 Hand select quality Agate Coaster Set of 4 with FREE Rubber Bumpers to protect your furniture. Due to the natural materials used each specimen is unique and will be similar to the shape and orientation shown in the pictures. Suitable for Home & office,collecting,gifts,study.The specimen chunk creates a force field to strengthen one's aura while protecting the energies from being sapped by others.This also works towards revealing patterns that has led one to an undesirable emotional state,thereby facilitating healing/meditation of his or her subconscious. Suitable for Home&office decoration, collecting, gifts, study. The specimen chunk creates a force field to strengthen one's aura while protecting the energies from being sapped by others. This also works towards revealing patterns that has led one to an undesirable emotional state, thereby facilitating healing/meditation of his or her subconscious. 1 Top Plaza Velet Jewelry Pouch. Great home decoration for living room, office. Made of natural gemstone crystal. Crystal money tree(or Tree of life) can ward off negative energy from around you, brings luck, prosperity, provides protection against any kind of losses, and enhances the power of an individual. Excellent gift for housewarming, business opening, congratulatory and blessing purposes. Please arrange the branches and roots patiently when you receive it. You can make it look how you want. Useful for Positive Energy, Healing, Meditation, Peace of Mind, Chakra Balancing & Concentration. Please note: Natural stone might vary in colors shapes, sizes, making every lucky money tree of life unique and special. 90-Day money back guaranteed. If you are not completely satisfied with the product,please contact us through buyer seller message. We promise we will try our best to make you happy. Buy without risk. 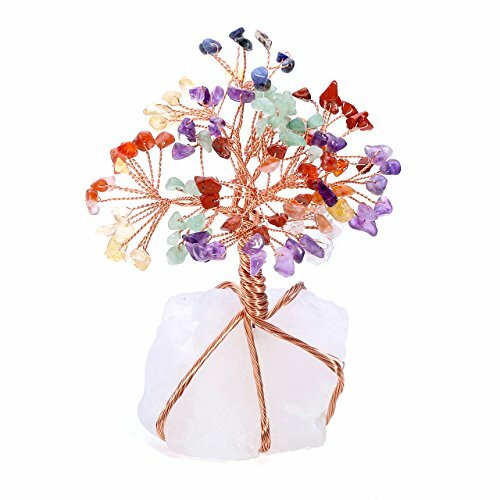 Natural Handmade Gemstone Copper Wire Wrapped 7 Chakra Tree of Life Money Tree. Brings wealth and luck. Good for home decor or chakra crystal healing, It is said to improve career luck as well as an excellent Feng Shui Figurine for those who are in managerial positions . Put it in your living room or office. It will help you attract wealth and prosperity, success, and all good things. Money Tree heigh is approximately 5.1-6.3(13-16cm)(when open up leaves);Size for Clear Quartz Stone is approximately 2.36- 3.54(6-9cm);Copper Wire;Total weight:approx 600 grams/pc; Material:Natural Stone & Copper. 7 Chakra Crystals Material: Amethyst--Sahasrara(Or Crown Chakra), White Crystal--Ajna(Or Third-Eye Chakra), Sodalite--Vishuddha(Or Throat Chakra), Green Aventurine--Anahata(Or Heart Chakra), Yellow Aventurine--Manipura(Or Solar plexus/navel chakra), Red Jasper--Muladhara(Or Root Chakra), Carnelian--Svadhishthana(Or Sacral Chakra). Money tree brings luck, prosperity, provides protection against any kind of losses, and enhances the power of an individual. Great decorative statue to put in office, front door, and living room. Polished crystal hearts are a perfect gift as a symbol of our love. They are great to look at, fit perfectly in your hand when meditating and make a wonderful addition to anyone's crystal collection. all of the crystals have vibration, through contact with a variety of crystal vibration to adjust your physical and mental balance. 2.14 pieces of basic chakra set is the perfect gift for yourself or lover or friends ,that can be used to improve the efficiency and attention, restore balance and harmony, health and happiness, create more joy and satisfaction. It can also be used for massage, ritual, encouragement, reiki healing,celebration, yoga, home decor,meditation or relaxation. 3.Each of our carefully chosen crystals is carefully examined,recharged and cleansed, striving for the perfect combination and giving you a more wonderful experience. The exquisite package, the beautiful gift box gives you or the lover or the friends unforgettable experience, the feeling healing crystal's charm. 4.The ancient chakra is the key that opens your energy.Expect you to explore the mysterious energy.and the healing crystal chakra kit is your best bet. 1.Natural healing crystal chakra: basic healing crystal chakra kit is through the crystal healing power, changed your vibration, achieve balance, overcome the difficulties and challenges, take you into a magical journey. 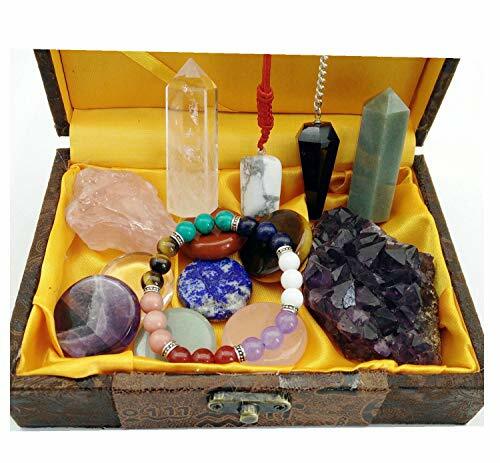 2.Beautiful gift: box size: 6.3''x4.4''x2''.This is the perfect gift for beginners, if you want to surprise and encourage for lover or friends,Perfect packaging, beautiful and fashionable, all healing crystals are placed in exquisite gift boxes. 3.High quality products: each healing crystal is carefully selected and we strive for the perfect combination.Since each one of natural crystal is authentic and unique, their shape, size and color will vary, but in essence it is perfect, so you will receive similar crystal. 4.Each one of healing crystal has been cleansed and can be used for energy work, spiritual practice, yoga, reiki healing, witchcraft rituals, home decor, meditation and relaxation. 5.Perfect chakra combination: 7chakra polished palm stones,2 crystal points,amethyst cluster,raw pink quartz,obsidian reiki pendulum,chakra bracelet,white turquoise pendant,crystal size varies approximately from 1''-2.4''. 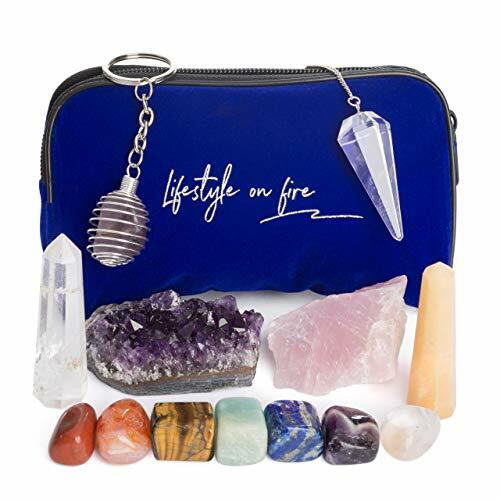 The Lifestyle on Fire Chakra Kit is an all natural crystal set. While other crystals and healing stones sets claim to be authentic, oftentimes they contain chemically altered or dyed chakra crystals that are not good for healing energy. The Lifestyle on Fire Chakra Kit features the 14 genuine, cleansed, composite-free, all natural crystals and stones that are essential to your chakra kit:-The 7 Chakra Stones (1 inch): clear quartz, amethyst, lapis lazuli stone, amazonite stone, tigers eye, carnelian stone, and red jasper stone -Amethyst crystal cluster, Rose quartz crystal -Clear and golden quartz crystal wands, solid clear quartz pendulum in a Velvet zippered carrying pouch. A 41 page Ebook featuring chakra crystal and stone descriptions and instructions for use in Chakra healing and balancing, meditating with crystals and pendulum divination. Includes a Cage keychain so you can carry any stone with you. Handcrafted in India the birthplace of the chakra system, our richly colored, vibrant, and powerful healing crystals have been specially prepared for energy work, chakra healing, reiki, wiccan rituals, chakra meditation, massage and Bohemian decor. Chakra stones and crystals have a special vibration that balances the mind, body, and soul, heals pain and illness, and renews energy and well-being. At Lifestyle on Fire, we believe in bringing balance, harmony, and peace into our customers' day-to-day lives. We have faith in our chakra balancing kit and its power in helping you achieve all of this. This crystal set is a must for home or office. Healing crystals are now a necessity in health. Worry stones(palm stones,thumb stones)are smooth,polished stones,used for relaxation or anxiety relief. Enhances happier moods very noticeable. Helps reach higher vibration of energies. Carved from irregular stone,each piece is unique,picture is only for your reference,the size and the color may vary from each other. 1 PC Oval Worry Stones,hand carved,vary slightly in size and coloration. Pocket Stones--Weights 2.8 ounces/piece;Approx:2.3x1.5x0.7(60mmx40mmx20mm).Fit easily in a pocket,perfect to hold in hands,daily carry,wrap,place in grids or any place else you wish to. Polished Stones--Smooth and feel great to hold in your hand for relaxation or anxiety relief.Enhance meditation,aid in healing the mind,body and spirit.Strengthens the heart and allows energy to flow through the heart chakra properly. 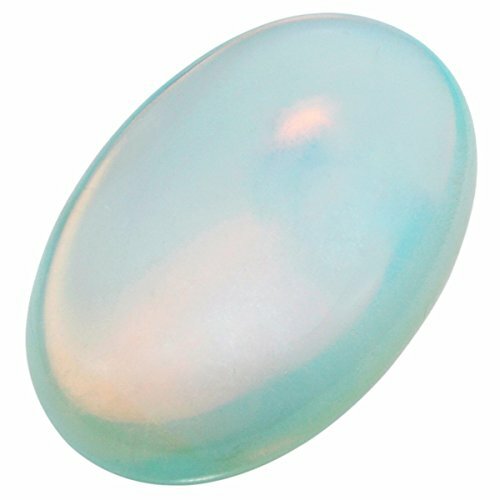 Best Gift Choice--Comes with a beautiful black velvet gift bags.Oval worry stones make very special personal gifts.Arrive to someone full of positive energy and cleansed of all negative vibrations. BLACK TOURMALINE CRYSTAL - A Tourmaline stone is said to help repel and protect against negativity. It is excellent for defecting radiation energy. It enhances ones physical well being by providing and increase in physical vitality, emotion stability which helps with relieving stress, and intellectual acuity. It is also a strong radiation block and EMF protector. HEALING CRYSTAL IN BULK - We offer a wide variety of rough stones in bulk. One pound of rough tourmaline chips, half pound of tourmaline, and 1 pound of tourmaline. Not only do we provide healing stones in bulk we also offer wholesale pricing to every customer. MEDITATION STONE - Tourmaline is an excellent grounding crystal for meditation and healing. It is thought that it helps soothes panic attacks, especially those caused by dark or confined places, or in places where the atmosphere is frightening. HOW TO USE TOURMALINE - Use them as vase fillers, centerpieces for your dining table, use them in your house to absorb electromagnetic energy. 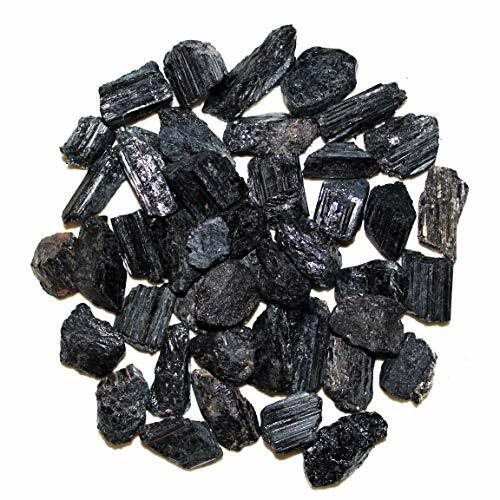 Energetically grid a room in your home or office by placing black tourmaline in the four corners or the space. Wear or carry it in your pocket or purse. CUSTOMER SATISFACTION - Rock quality is the utmost importance for us and if you feel that you are unhappy with your purchase please contact us so that we may send you a replacement or refund you. Functions: Home decorations or as energy stone can activate the chakras of all parts, No matter what you are seeking - energy, healing, relaxation, inspiration, balance, or inner peace. You will receive SIMILAR as the PHOTOS SHOWN but unique size and color,due to the natural variation in natural stone weight, size, color and shape may vary. Since ancient times, people from different cultures have believed in the spiritual energy and protective power of stones and crystals. The different colors have different meanings, different types of minerals promote different energies, and even their placement can change the atmosphere in a room. With Crystal Allies, you can experience the thrill of finding out which minerals speak to you, and seeing how the energy in your home changes depending on where you place your specimens.Beautiful heart shaped chakra sets of 7 stones symbolizing body chakras. Please feel free to contact us if you have any questions with your purchase! Our crystals have been charged with positive, loving energy. You will always bring home a crystal that provides you with a powerful feeling of self worth and appreciation. Don't forget to cleanse your crystals and charge them with your own energy to make them yours. 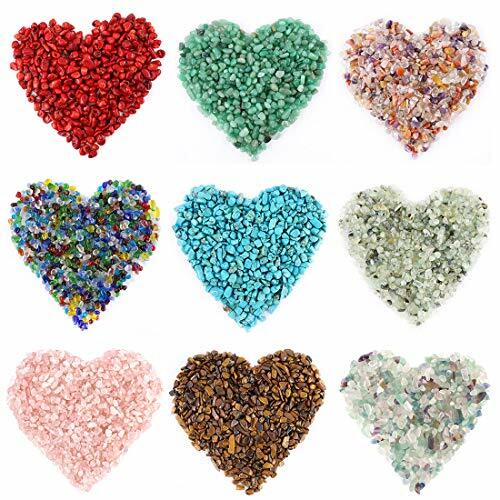 Heart crystals are great for altars,grids,terrariums,pocket stones,gifts,home decorating,collecting and more! They are also wonderful additions to meditation,reiki and chakra work. Each stone is unique and beautiful so please expect slight variations in color,texture and size. You will receive ones similar as picture shown. Meditation stones,or palm stones,are a wonderful part of your quiet time. You can comfortable to hold them between the hands or in the palm of your hand. The energy of the stone flows through you as you meditate or spend time in peace. Also can be carried in ones pocket or purse as a peaceful reminder of gratitude. Gift recommend--Come with gift pouch for easy storage, also an ideal gift Valentines Day, Mothers Day, Anniversary Day and Birthday to your friend, wife and mom and daughter.